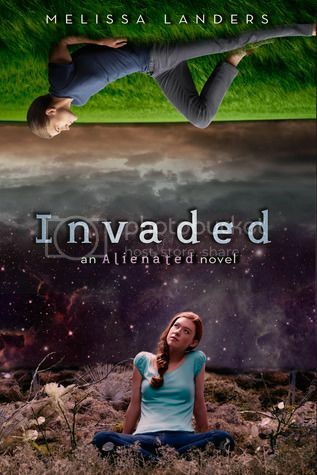 I was soooooo very excited to see the cover for Invaded! I adored Alienated, and I can't wait to get my hands on the sequel. I'm dying to see what's going to happen next! Nice! Seen the first one of this series around a lot! Like how the covers are similar yet different! I haven't read Alienated but the premise sounds interesting. Hope you enjoy the book! I haven't read the first one yet but it is on my TBR. February 3rd of NEXT YEAR? That's so far off! Great pick! I haven't read Alienated yet but it's on my wishlist, hopefully I'll get to it before this one comes out. Love the cover! Great pick! I still haven't read the first book yet, really hope to get to it soon though. Thanks for sharing and stopping by! I haven't read Alienated yet but I really can't wait to read this series! I love the cover :) thanks for sharing! Obviously I must read Alienated! It seems everyone loves it! Haven't finished Alienated yet . . . SPOILERS, lol. I've seen a lot of good things about the first one but I'm not really a fan of alien stories. I hope you enjoy this one though. Nice pick! I have Alienated to read. Love this cover too. Awesome pick! I definitely agree with you on this one! I read Alienated recenty and really liked it, I can't wait for the Invaded. I still need to read Alienated. I have it on my Kindle, so I have no excuse. I've heard great things and am excited to dive in. Great pick!